I’m going to show you everything you need to know to get started blogging, and have even put some great free resources together for you. Over the years I’ve seen so many people who want to start blogs and don’t, and I’ve realized that even if you know exactly what to do, getting started is still the hardest part. The learning curve for growing a blog seems steep, and unfortunately, it's what keeps thousands of potentially incredible bloggers from starting their own blogs every year. That's why I decided to create Launch That Blog as a way to make starting a blog easy so that you can focus on what matters most: sharing your unique message with the world. I'll talk more about Launch That Blog (LTB) and how this free service will make the process of starting a blog simple, but first, I want to help you figure out if starting a blog is a good choice for you. Let's get this out of the way first – I'm not some kind of tech genius. I had no idea how to run a blog before I started this website. I was a high school band director that had worked hard to pay off a lot of student loan debt, and I wanted to help people that were in the same situation that I had been. In fact, I was so intimidated by the prospect of starting a blog that I put it off for months. I would share what I had learned about personal finance on my private Facebook page but realized pretty quickly that I could only reach so many people that way. I wanted to reach thousands of people, not hundreds. So I finally jumped in and started my own website. Talk about stressful. All of the sudden, I was drowning in technical terms like themes, plugins, hosting, and more. It kinda sucked, honestly. All I wanted to do was write! That's where Launch That Blog comes in. My team takes care of all the tech stuff so that you can get started blogging faster. I spent hours and hours watching YouTube walkthroughs, reading OTHER blogs about how to actually get mine started, and slogged through tutorial after tutorial just to get to the point where I could even write my first blog post. Launch That Blog will do all of the hard stuff for you. We set up your blog, teach you how to use it and make it look awesome, and even make sure that the essential tools you'll need to start blogging are installed for you. All for the low low price of…free. Seriously. Here's the deal: There's a good chance that you have something you want to share with the world, and blogging is an awesome way to do it. Let's say you make incredible recipes, and you want to teach other people how to cook food like you. Maybe you have a big financial goal, and you want to inspire other people by telling your story. Or…maybe you just like puppies and want everyone who loves puppies to love puppies with you. Puppy blogs are the best blogs. For me, I just wanted to share my message with other people that had student loans and show that paying them off early was a real thing that they could do too. Now don't get me wrong, I wanted to make money blogging. I'm not shy about that. And the cool thing is that making money with a blog is a real thing, and you don't have to be the next Mark Zuckerberg to make it happen. Remember…I was a teacher. A high school band director. Now, I work from home full-time making great money and have been on Forbes, Business Insider, CNBC, and tons of other sites that I never even dreamed of being on. I've even been on TV before, all because of my blog. Am I promising that you'll do the same? Heck no. Not at all. But I’ve seen enough bloggers reach success to know that it’s possible for you. What I am saying is that blogging is a platform that you can build a reputation on and do so much with. It's not just about making money from ads or selling products on your website. You can make money as a freelancer or as a speaker, or even land book deals. I have so many blogging friends that have used their blog to build a completely different career path for themselves. Some have become authors. Some have become speakers. Some travel full-time in RV's and Sailboats while working online. It's pretty incredible, really. And here's the other thing – you don't have to be a professional writer to make this happen. I'm pretty notorious for typos. I'm not exactly perfect in the grammar department either. But that's OK because what matters is authenticity. If you have a real message to put out in the world, you can blog. That's the truth. There is probably something you know that others don’t, or maybe something that you have a passion in your life that you love telling all your friends about (if you start a wine or bourbon blog, let me know…I’ll read ALL of your posts), so why not write up a blog post and share it with the world!? If you’re here, reading this post, you already know how powerful a blog can be and maybe have even had your life changed because of one. How much more do you think owning a blog can change your life? For me, and many of my blogger friends, it changed everything. Instead of spending every day at a job we hated, we work when we want from the comfort of our own home often making more than we did that job anyway. When you start your blog using Launch That Blog’s free service getting started is easy, you’ll get a ton of great benefits, and it will take you under two minutes, because we do everything for you. BONUS: How to Customize Your Blog – my web developer for Millennial Money Man and Laptop Empires has put together a special bonus training showing you exactly how to customize your theme to make your blog look great in minutes! There is literally only one thing you have to pay for…hosting. Launch That Blog does everything for you but store the website on a server. You'll need to pay for that, but fortunately, you can get that as low as $2.95 per month (billed annually) when you use Launch Your Blog to set up your site. With Launch Your Blog, this whole process is going to be really easy. Follow the three steps below to get started. You'll get your domain name for a full year free of charge. All you have to do is pick a name and move on to the next step. Step 2. Go here to select your hosting on Bluehost. I've negotiated a special low price with Bluehost for everyone that uses Launch That Blog, and you can get hosting that costs as little as $2.95/month (paid upfront annually). Step 3. Go here and complete our blog setup request form (fast, secure, and easy) so that we can get started on your blog installation. Remember, this is a completely free service. We just need some information from you so that we can complete your blog installation. As soon as you fill out our form in step 3, we'll get started on your blog set up right away. Within two business days, you'll have everything you need to start blogging. Remember…you'll get everything that's included in our blog setup service, as well as the training from me and your bonus goodies. Less than 5 minutes of your own time is all it takes to become a blogger and start sharing your message with the world. Still have questions about the setup process? No worries. Keep reading for the finer details. For example, take mine – www.MillennialMoneyMan.com. I'm a Millennial. I'm a man. I write about money. Boom. Now if you wanted to really dissect this and find a fault with mine, Millennial is pretty hard to spell for a lot of people. It's a strange word. Try to avoid strange words if you can! If you want to use your name, use your name. If you want to use something else, do that. You can always change this later down the road if needed. Also, avoid numbers if possible and for the love of everything good in this world try not to use hyphens. People have a really hard time typing in domains with either of those two elements. If it takes a little bit of time to find a good domain name – don't worry! Just don't take forever, because at some point done is better than perfect. Don't panic. When I was selecting my domain name, the first few that I wanted were not available. It took a few tries, but I landed on MillennialMoneyMan.com, and the rest was history. If it is available – awesome! You'll move on to the account creation process, which is detailed in step 2 below. Now, this part is important – if you want to take advantage of Launch That Blog's free setup service and all of the bonus training material that I provide, you'll need to purchase Bluehost hosting through Launch That Blog's link. Well…it's simple. When you purchase hosting through our link, we get a commission from Bluehost for sending you their way. Using our link does not add any extra cost to you, but the commission from Bluehost allows us to provide you with this free setup service. I'm basically bribing you to use my link by giving you a ton of free stuff. It's a win-win for you and me. My advice to you as a brand new blogger (but soon-to-be awesome blogger after you get all of my free Launch That Blog training videos) is to select the Basic plan. The other ones look great with all of the extra features, but you don't need them. You'll have everything you need to create an incredible blog with Basic, and you'll keep more money in your pocket. How much is Bluehost going to cost? If you're looking for the most value and lowest per-month cost, this is the option you'll want. I recommend this option because it locks your hosting in for three years at less than $3 per month. Also, that $2.95/month for hosting is an exclusive perk for anyone who purchases hosting through Launch That Blog. I've been with Bluehost for a long time, so they give my people a discount (it's usually about a dollar more per month). Yes, the total cost of this option is cheaper in the short-term, but you're locking yourself into a much higher price that will likely go even higher when you have to re-renew after the first year. Also – I'm a firm believer that you need to go into blogging with the expectation that you'll be doing this for more than just one year. I want you to commit to doing this for the long haul so that you can really do something special with your blog. So basically, choose “Basic 36 Month Price” from the drop-down menu if you want the best value and lowest monthly cost. Pretty simple. Which hosting add-ons and extras should you choose? 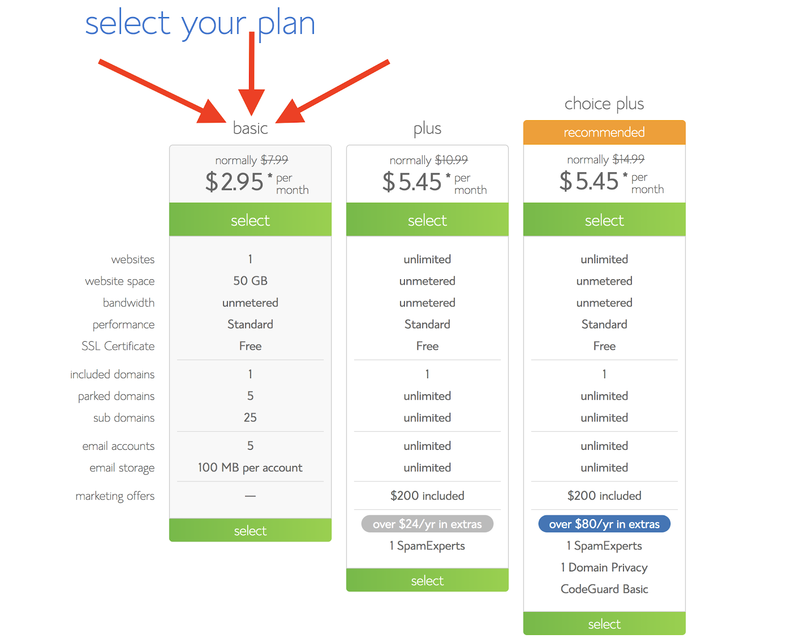 After you select the Basic, plan, Bluehost will give you add-on options. You DO NOT need all of them. The only one that I recommend is the “Domain Privacy Protection” add-on. Domain privacy protection keeps all of your contact information hidden, and for about $12/year, I think it's absolutely worth it. If you don't select it, you'll get a bunch of spam phone calls and emails. I went the super-cheap route when I first started my blog and opted out of domain privacy protection, which turned out to be a very inconvenient/annoying decision. Create a password for your Bluehost account and SAVE it somewhere! This is extremely important – after you pay for your hosting, you'll be prompted via email to create a password for your Bluehost account. Create a great password (please make it something that someone can't guess), and don't just rely on your memory. Write it down and do not lose it! You'll need to send Launch That Blog your password using our secure form below so that we can install your blog and set it up with everything that you'll need. You're almost there! Once you submit your Bluehost information to us through our secure form, Launch That Blog will get to work on installing your blog and making sure it has everything you need to be successful. Remember – you'll still need to make your blog look the way you want it to after installation (we include an awesome training that walks you through the steps), but we are going to take care of everything else for you. Please give us two business days to complete your installation. We'll also send you an email with all of the free bonus training guides that you get for using our service as soon as we verify that you used our official Launch That Blog link to purchase your hosting. If you have a message to share and want to make an impact on others while growing an incredible business, starting a blog is the way to do it. Our team at Launch That Blog will it simple for you to start blogging. That’s it! Please allow two business days and we will have your brand new blog installed for you and you’ll have plenty of free bonus goodies to get started quickly.